There are 20 freebies today. Make sure to check back throughout the day as I’ll update this post if free samples become available. Don’t miss out on freebies we share on the BargainBabe.com Twitter. Follow us today! 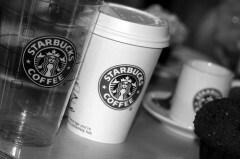 Starbucks freebie – If you are not yet a member of the My Starbucks Rewards club, here’s another reason to become one! Through March 14, when new members register a Starbucks gift card and become a My Starbucks Rewards club member, they’ll receive a FREE $5 gift card (as a credit)! Starbucks freebie – Now through March 3 you can enjoy a FREE pastry with any Starbucks Grande or Venti Espresso beverage purchase! This offer is valid at any Target Starbucks store, not the stand-alone Starbucks locations. Red Mango freebie – Join Club Mango and get a FREE cup of frozen yogurt at your local Red Mango location (up to a $5 value)! Just enter your email address and click “Go – I Want My Yogurt” to join. Complete your registration information and a $5 credit will automatically be added to your account. You can download the Red Mango app, or look up your account with the phone number you provided during registration to redeem your credit. Free L’Oreal – Sign up for FREE L’Oreal Triple Resist Haircare samples. Free Recipe booklet – Sign up for a FREE SunMaid Taste of the Tradition recipe booklet. Free Magazine Subscriptions – Get your FREE subscription to Seventeen Magazine over at Mercury Magazine. This offer won’t last long so don’t delay. When you enter your info, you can check off none in the business categories if you like. Free Centrum – Score a FREE sample of Centrum Flavor Burst Chews! Note that their site seem to be running a bit slow. Your sample will arrive in 6-8 weeks. Free Tan Lotion – Sign up for a FREE Lotion Tan sample. Free iTunes App – Snag the game Plants vs. Zombies for FREE and start killing zombies! It’s Apple’s “App of the Week.” I hear this is very addictive just like Angry Birds. St. Ives Freebie – Through March 8, LIKE the St Ives Facebook page and click on The Naturally Joyful Challenge tab to enter The St. Ives Naturally Joyful Challenge. The first 50,000 entrants to register, upload a photo and then share the challenge with friends via email will each snag a FREE sample of St. Ives Naturally Soothing Oatmeal and Shea Butter Body Lotion (allow approximately 3-4 weeks following the promotion conclusion for the sample to arrive). Your friend will also receive a FREE sample! Bath & Body freebie — Bath & Body Works has a new coupon out! Print out the coupon to get a FREE product worth up to $14 with a purchase of $10 or more. Baskin Robbins freebie — Head to your local Baskin Robbins every Wednesday from now until the end of March to snag a very sweet offer: Buy One Two-Scoop Sundae and Get One Free! Woohoo!!! Be sure to call ahead as this offer is only valid at participating Baskin Robbins locations. Dial freebie — Now through March 31, head on over to the Dial Facebook page and click on the “Healthier Skin” tab to enter to win a FREE bottle of Coconut Water body wash (250 winners!) or a $1,000 grand prize (1 winner!). A random drawing will take place on or around April 4. 7-Eleven freebie — Download the 7-Eleven FREE app. After you do, sign in or create a 7-Eleven account to view special offers. You will see one for a FREE Medium Slurpee, valid through March 25! Do not tap “Redeem Offer” until you’re ready to score your Slurpee, as it is only good for 15 minutes once you do. Free Long John Silver’s — Last day! Calling all you shrimp lovers! Head to the Long John Silver’s Facebook page and click on the link on their wall post to score a coupon valid for 3 New Bigger Shrimp for FREE. Home Depot freebie — You can take your kids to a FREE kids workshop at The Home Depot on Saturday, March 2 to make a Race Car from 9 a.m. to noon. You will get all supplies needed for this project for FREE. Workshops teach children do-it-yourself skills and tool safety along with instilling a sense of pride and accomplishment. All kids get to keep their craft and receive a FREE Kids Workshop Apron, commemorative pin and certificate of achievement. Workshops are designed for children ages 5-12. Plan to attend at your local Home Depot. Larabar freebies — Ends today! Enter once for a chance to win LARABAR’s Uber Large Sweepstakes. There are 1,091 prizes to be given away including: 1 — single-speed Felt bicycle, 15 — tote bags stuffed with goodies, 20 — $10 donations to Make a Hero, 25 — 15-ct boxes of Apple Turnover Ã¼ber bars, 30 — water bottles with 4 Ã¼ber bars and 1,000 — coupons for 1 FREE bar. TGI Friday’s freebie — Download the free TGIF mobile app. Once downloaded, you’ll want to click on the “Happenings” tab and then click on the “App for an App” tab to snag a coupon valid for a FREE appetizer (up to an $8 value!). This is a one-time use coupon valid for dine-in only at participating TGI Friday’s restaurants — expires March 15, 2013. And the best part — no purchase is required! Free Krystal’s burger — Last chance to get this freebie! Head on over to the Krystal Facebook page and click on the “Be My Krystal Valentine” to score a coupon for a FREE Krystal or Chik sandwich. Just select your favorite card and share it with your Facebook friends or print it out to redeem. Free Clarins sample — Last day! Enter once for a chance at a free sample of Clarins Double Serum from their Facebook page. Once entered, you are eligible for the entire duration of the promotion. There will be a weekly randomized drawing of 1,000 winners for 4 weeks.